I’m just the same. It has to be Moleskine. And I imagine my notebooks being pored over by literary scholars who are trying to plumb my genius. For a long time I did what Natalie Goldebrg told me to do. Cheap notebooks were the best, she said, not the fancy ones that make you feel precious about your writing. Keep it simple. 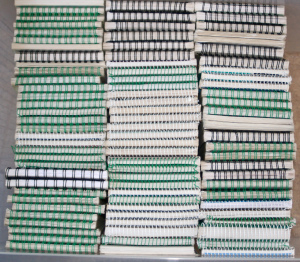 So for many years I wrote in spiral-bound A5 notebooks. I wrote with a blue biro, and only blue would do. I met people who wrote in other colours: black, green, someone’s husband used a brown pen, and there were those who’d write with whatever was at hand. Some people weren’t picky. I was picky, and pickiness is a form of superstition, a way to ward off dread. For years I wrote like this in notebooks with 80 sheets, ruled lines, some were perforated, but it was bad luck to tear pages out of a notebook. I’m not sure where I got that superstition from. Many of my superstition are of my own making.